Santa Monica, CA – September 5, 2018 – Skydance Media in partnership with ZAG today announced that it has secured the live-action feature film and television rights to the global animated phenomenon Miraculous® – Tales of Ladybug & Cat Noir. Under the deal, Skydance plans to develop and produce the first-ever live-action adaptations based on the hit property with an anticipated release in 2020. The critically acclaimed, award-winning animated television series developed and produced by Jeremy Zag follows two heroes—Ladybug and Cat Noir—as they protect the city of Paris from super villains. ZAG’s aspirational series Miraculous – Tales of Ladybug & Cat Noir—winner of the 2018 Teen Choice Award for Choice Animated Series, airs in over 120 countries worldwide, regularly scoring #1 rankings in kids 4-11 demo. Miraculous has a passionate and active teen fan base, the “Miraculers” with over a million global subscribers to YouTube and 17 billion watch-time minutes in its lifetime with both official and user-generated content. The fans drive high interactivity on Instagram with over 300M followers regularly engaging. Miraculous consumer products have 350 licensees worldwide. Winning multiple industry awards in licensing and consumer products, merchandise passed the $100 million mark in retail sales in 2017. Miraculous – Tales of Ladybug & Cat Noir follows the adventures of two seemingly typical teens with secret identities, Marinette and Adrien, who magically transform into superheroes, Ladybug and Cat Noir. As secret superheroes Ladybug and Cat Noir are partners in the action. But in the daytime, Marinette is just a normal girl, living a normal life. 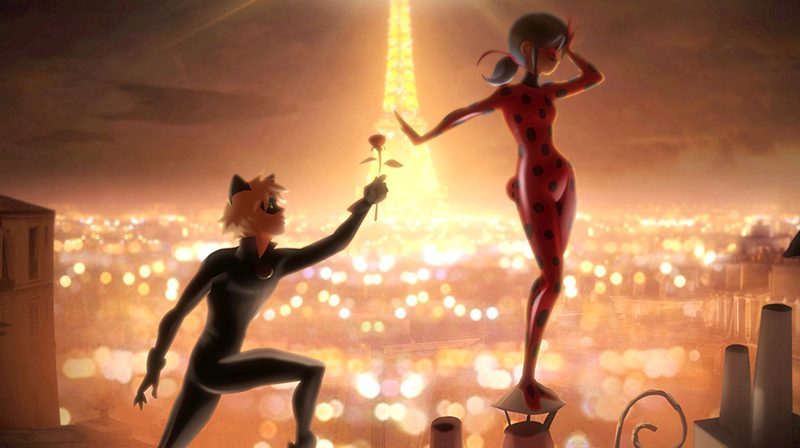 Cat Noir will do anything to support and impress Ladybug, but does not know this is Marinette from his class. Marinette, the regular girl, in turn dreams of Adrien and simply gets little response. When evil threatens Paris, their beloved City of Lights, can they beat the unexpected villains? Miraculous taps into first love, secrets, friends, magic, duality and the romance of Paris. Skydance is a diversified media company founded by David Ellison in 2010 to create high-quality, event-level entertainment for global audiences. The Company brings to life stories with immersive worlds across its feature film, television, interactive and animation divisions. Recent feature films include Mission: Impossible–Fallout and Annihilation. Skydance’s upcoming feature films include Top Gun: Maverick, 6 Underground, Gemini Man and the Untitled Terminator project. Skydance Television launched in 2013, and its current slate includes two Emmy-nominated series, Grace and Frankie and Altered Carbon, Tom Clancy’s Jack Ryan, Condor, Dietland and Foundation. Skydance Interactive launched in 2016 to create and publish original and IP-based virtual reality video games; their library includes the mech-shooter game Archangel: Hellfire and the upcoming 2019 title The Walking Dead: Saints and Sinners. In 2017, Skydance formed an animation division to develop and produce a slate of high-end feature films and television series in partnership with Spain’s Ilion Animation Studios.